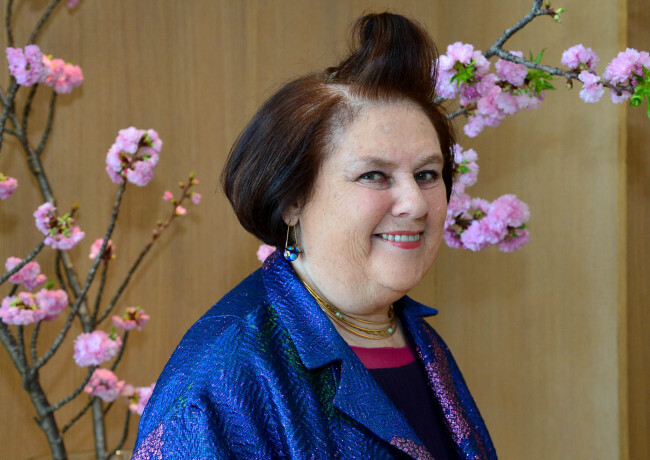 For more than a quarter-century, Suzy Menkes has crisscrossed the globe, reporting from the front rows and back stages of fashion shows, giving the layperson intimate insights into the baffling world of fashion with her astute observations, and predicting the next big trend. “Today, there is a lot of mindless fashion, churning out of fast fashion,” said Menkes matter-of-factly during an interview with The Korea Herald at Hotel Shilla on Monday. 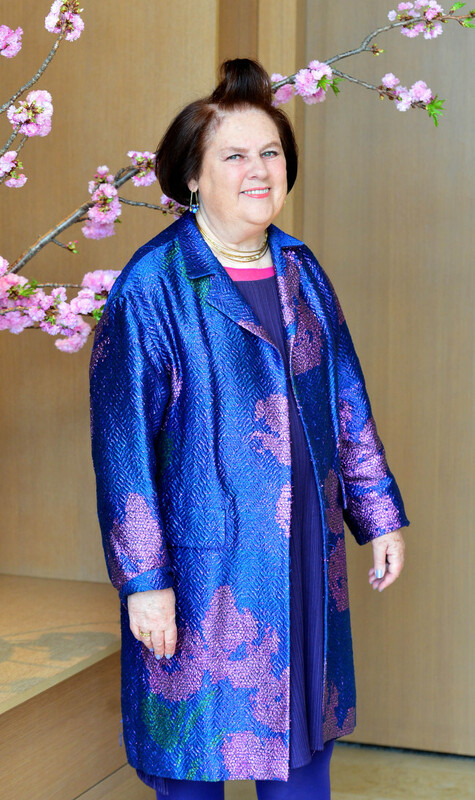 A doyenne of fashion journalism, as well known for her unique front-roll hairstyle as she is for her sharp, forthright critiques, Menkes was in Seoul this week as the organizer of the Conde Nast International Luxury Conference held April 20-21. However, Menkes does not fault fashion for the phenomenon. “Fashion has a way of expressing what is happening in the world,” she said, while insisting adamantly that fashion is not frivolous, as some people are wont to believe. “Often, you only realize the significance of what you saw afterwards,” she said. “I can remember, 15 years ago, the accepted idea was that a new look took about seven years to become absolutely worn by everybody. No one would suggest that now. People will laugh at you,” she said. However, lying beneath the fast-evolving fashion trends are slow changes that happen in the way people dress, according to Menkes. Gender-neutral dressing is an example. “There is a major change in attitude, the first true trend of the 21st century. Women are no longer feeling that they have to be beautiful for men, that they can wear what pleases them and men feel that they can be more like peacocks,” she said. “I’ve been told by a designer that it works quite well as a concept in Asia because women’s and men’s figures here are not so different,” she said. The coming together of digital technology and fashion is also big on Menkes’ mind. “An extraordinary thing that is going to happen in the 21st century is the digitalization of fashion. Very soon, it will be possible to copy clothing via computer. Three-D printing will make clothes fit so much better,” she said. The “see now, buy now” approach to fashion business, adopted by a number of high-end fashion companies, is an outcome of the frustration of fashion houses who invest a lot of time and money into their collections only to see their runway creations copied and in stores all in the same day. Traditionally, a gap of several months existed between the presentation of seasonal collections and when they became available to consumers. Yet, for luxury brands, Menkes does not believe that the “see now, buy now” concept is feasible, except perhaps for small collections of clothing. Commenting on the revolving doors of big fashion houses where big-name designers switch houses constantly, Menkes attributed the phenomenon to the unhappiness of designers. “When fashion doesn’t really know whether it is artistic or entirely about selling, there is also a push for more, more, more,” she observed. Designers like Valentino and his partner Giancarlo Giammetti have said they do not know how designers do it these days, according to Menkes. “For a truly artistic person, it is not possible to just churn things out.” Understandably, this has created a lot of unhappiness and unsettled situations. Some designers also behave like prima donnas, whereas in the past designers were more down-to-earth, said Menkes. Citing Korean menswear designer Juun.J, Menkes said, “Juun J. is an example of how a designer should grow.” She pointed out how Samsung spotted his talent, took him under its wings, and allowed him time and space to grow slowly. When asked her opinion on the recent controversy over fashion mogul Pierre Berge’s vocal objection to fashion houses producing Islamic clothing on grounds that they enslave women, Menkes suggested that it is not the role of people outside those countries to judge. She noted that luxury fashion houses making Islamic clothing is nothing new. “Islamic clothing has been going on for quite some time,” she said, giving an example of a French fashion house scarf that was designed to be used as headscarves by Muslim women. Menkes had spotted such items in a factory in Istanbul and the people there had explained that it was produced for the Muslim market. However, back in Paris, companies she contacted flatly denied the existence of such scarves. “What women want is the right to choose. I don’t think fashion and politics are a good mix,” she said. After 25 years at the International Herald Tribune covering fashion, Menkes now writes exclusively online for the 19 international editions of Vogue. “It is not a great shift. Words are words. In the end, they are just words,” she said about her move from print to online media. “I write for 19 Vogues. It is an interesting concept. Nothing can be taken for granted. I feel invigorated about it,” she said, explaining how her writings are presented different visually across the countries. “There were rigid rules about the use of social media at IHT. Conde Nast has a very different attitude. It is individual, original, beautiful and visually exciting. But as a writer, I like using my energy with words,” she said. As for her iconic hairdo, it was a product of practical necessity. Menkes explained that her hair would fall over her eyes as she wrote, getting in the way of writing. So, she pulled up the long strands that would fall over, held them high, folded them backward and secured the ends with a hair comb -- a new iconoclastic style born out of a marriage of fashion and pragmatism.